Shelby Kolek, Stephen F. Austin State University social work undergraduate, recently received the National Association of Social Workers East Texas Chapter Undergraduate Social Work Student of the Year Award. 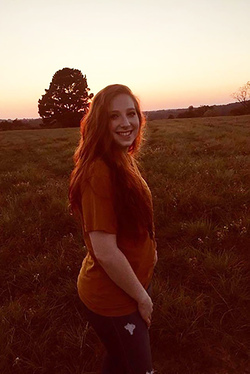 NACOGDOCHES, Texas - Shelby Kolek, Stephen F. Austin State University social work undergraduate, recently received the National Association of Social Workers East Texas Chapter Undergraduate Social Work Student of the Year Award. Kolek, who has served as vice president for both the School of Social Work Student Council and the Student Association of Social Workers, felt humbled when she found out she received the award. "I was shocked and honored that Dr. Copeland even nominated me, and it was even more amazing when I found out I won." Dr. Sam Copeland, Bachelor of Social Work director and professor of social work, nominated Kolek for the award. Copeland met Kolek two years ago when she was offered the SFA Regents Scholarship. Copeland said he nominated Kolek for the award because she sets an example for other social work students. "She has the intelligence, compassion, and commitment to diversity that will serve her well in social work practice," Copeland said. "Shelby is developing leadership skills and naturally mentors, tutors and supports other students. She is very gifted and enjoys sharing her knowledge while helping others." According to Copeland, the School of Social Work focuses on a holistic approach to prepare the next generation of social workers. "Shelby is one of many students who is benefitting from our efforts to prepare competent and effective social workers," Copeland said. "This award is merely confirmation of what professional social work BSW programs can accomplish when educating students is the first priority." Kolek, a junior from Navasota, plans to use her BSW to work in a juvenile justice center and then eventually in a drug rehabilitation center.